FUEL EFFICIENT 28 MPG Hwy/19 MPG City! GREAT MILES 14,135! F Sport trim. Nav System, Moonroof, Heated/Cooled Leather Seats, Satellite Radio, iPod/MP3 Input, Onboard Communications System, CD Player, INTUITIVE PARK ASSIST (IPA). CLICK ME! Leather Seats, Navigation, Sunroof, Heated Driver Seat, Cooled Driver Seat, Back-Up Camera, Satellite Radio, iPod/MP3 Input, CD Player, Onboard Communications System, Aluminum Wheels, Keyless Start, Dual Zone A/C, Smart Device Integration, Cross-Traffic Alert. Rear Spoiler, MP3 Player, Keyless Entry, Remote Trunk Release, Child Safety Locks. 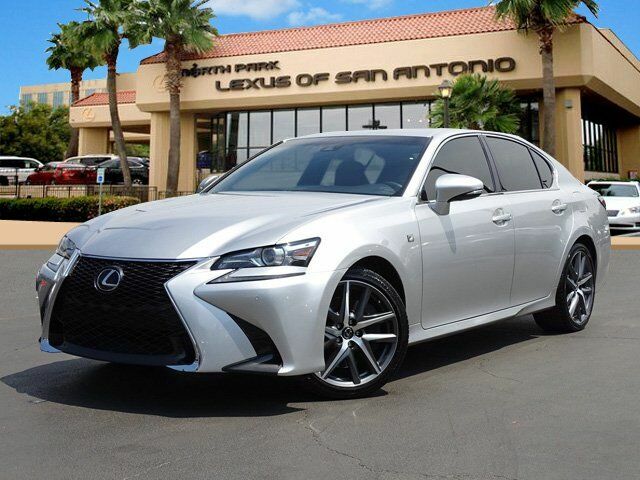 LEXUS SAFETY SYSTEM PLUS 1 LED headlamp, Intelligent High Beam, All Speed Dynamic Radar Cruise Control, Pre-Collision System, pedestrian detection, Lane Departure Alert System w/Steering Assist, INTUITIVE PARK ASSIST (IPA), F SPORT PERFORATED LEATHER HEATED STEERING WHEEL. Lexus F Sport with LIQUID PLATINUM exterior and RIOJA RED interior features a V6 Cylinder Engine with 311 HP at 6400 RPM*. Blind Spot Monitor, Lane Keeping Assist, Electronic Stability Control, Brake Assist, 4-Wheel ABS, 4-Wheel Disc Brakes, Tire Pressure Monitoring System Great Gas Mileage: 28 MPG Hwy. KBB.com's review says "When stacked up against the Mercedes-Benz E-Class, BMW 5 Series or Cadillac CTS, the GS proves a worthy competitor, offering similar levels of performance and technology plus superior long-term reliability and resale figures. ".